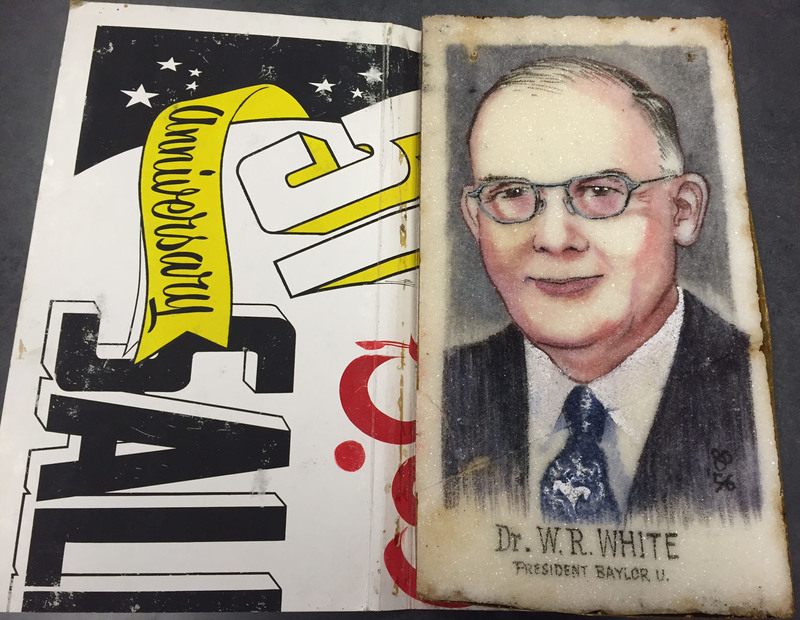 A few weeks ago, we found a most unusual specimen among the records of W.R. White, Baylor president from 1948-1961. 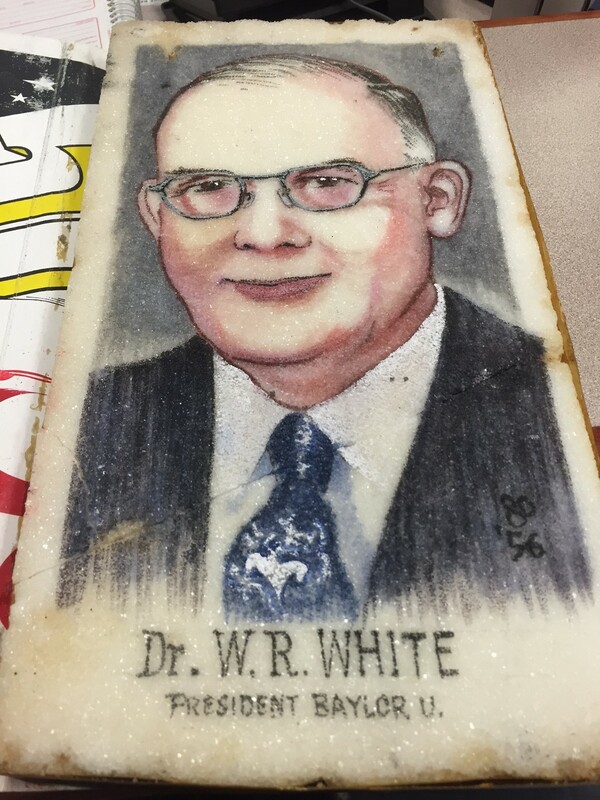 Museum studies graduate student Valencia Johnson is processing this collection, and she was surprised to find a portrait of White—painted on a block of sugar! Imagine pulling this out of a box! This artifact is part of BU records: Office of the President, Chancellor and President Emeritus (W.R. White) #BU/142. Fortunately, I immediately knew its context. Before coming to The Texas Collection, I was a writer in University Development and went to the home of Jerry and Mary Marcontell to interview them for Baylor’s planned giving newsletter. Jerry was a key member of the 1957 Sugar Bowl team, and hanging on a wall in their house was a portrait of him on a block of sugar—one was presented to each athlete. Fortunately, whatever they did to that sugar to prepare it for painting, it must have also deterred ants, roaches, and other insects who love sugar. There are a few baby roaches who appear to have met their demise in what looks like a tape frame around the object. (I’ve taken a picture of this but am told it’s rather unappetizing, so we’ll spare you.) There otherwise is not too much evidence of nibblings. It has lasted this long—almost 60 years now—and quite frankly, is an amazing object, so we decided to investigate ways to preserve the portrait. We’d love to hear if any other archives, museums, or other repositories have a sugar portrait in their holdings and how you’re going about preserving it. From the research we’ve done, it sounds like the Sugar Bowl had these portraits created for at least 10 years, so there must be more out there! Also, the enclosure and support of the portrait has a stamp for Krauss Co. Ltd., which from some quick Googling tells us was a New Orleans department store—perhaps the sugar artist was housed there? We can’t afford to take in additional sugar portraits—one is enough for research value and display, and we can’t afford all of the custom boxes and space it would take to preserve them. However, we’re delighted to have found this artifact—and with a few months to spare before the 60th anniversary of Baylor’s appearance in the Sugar Bowl! 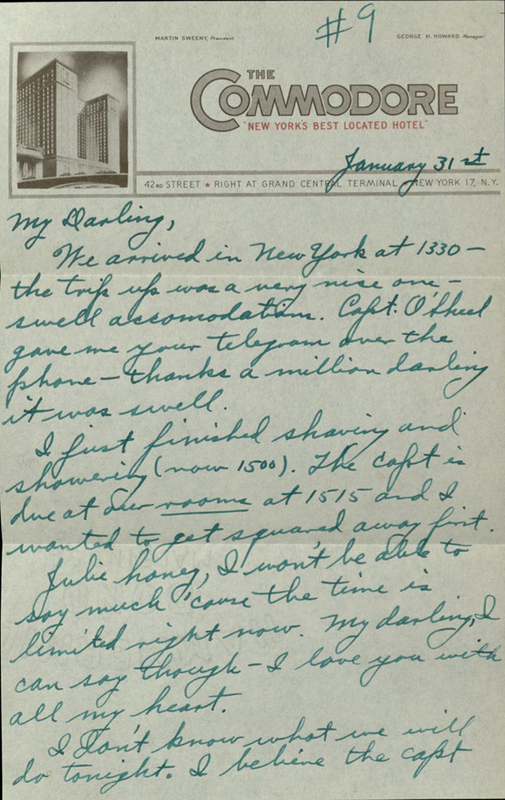 Letter from Onnie Clem Jr. to “Julie” Cecile L. Julian Clem during Onnie’s 1945 public relations tour in New York, Chicago, and Washington, D.C. They would marry seven months later. Onnie Clem Jr. papers #3939, box 1, folder 3. Grant and Donell Teaff Baylor Football collection, 1948-2006, undated (#3835): Contains correspondence, football programs, newspaper clippings, and audiovisual materials relating to Teaff’s career as head football coach at Baylor University. 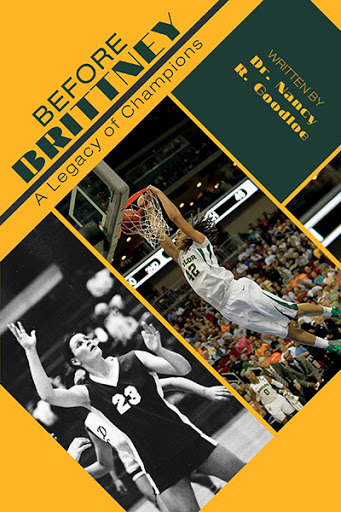 As usual, the materials described in the finding aid can be seen at The Texas Collection, but many of them also have been digitized as part of the Baylor University Libraries Athletics Archive in collaboration with the Electronic Library. Check out game films, ribbons, and more in the online collection! John B. Herpin papers, 1851-1910 (#1636): Letters, tax deeds, and receipts about Herpin’s tract of land in Liberty County, Texas. Onnie Clem Jr. papers, 1944-1948 (#3939): Letters between Marine Corps members Onnie Clem Jr. and “Julie” Cecile L. Julian Clem during World War II. Also included is a transcribed interview with Onnie Clem Jr. about his experience during the Bataan Death March and as a prisoner of war for two and half years. 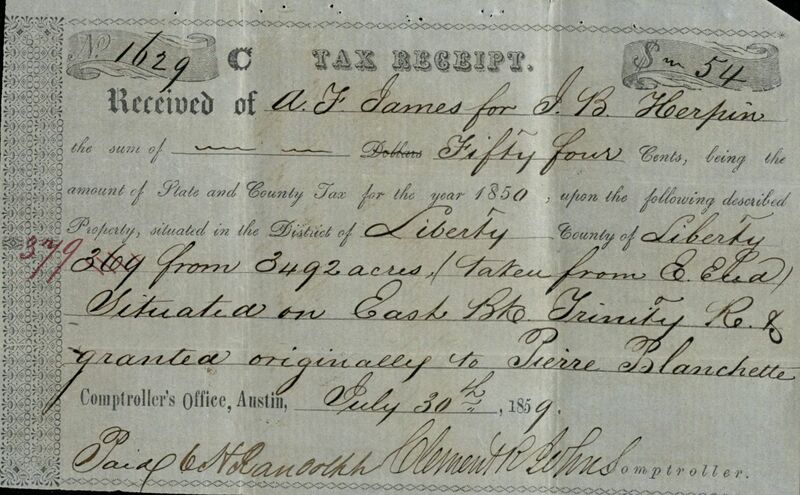 Tax receipt from 1850 for John Herpin’s land claims in Liberty County, Texas. A dispute about ownership of this land was still going on in 1910, according to the collection. John B. Herpin papers #1636, box 1, folder 2. John M. Bronaugh papers 1862-1887 (#63): Contains Bronaugh’s records from his time as Confederate surgeon for the 5th Texas Cavalry during the Civil War. How would you answer the questions on this test? 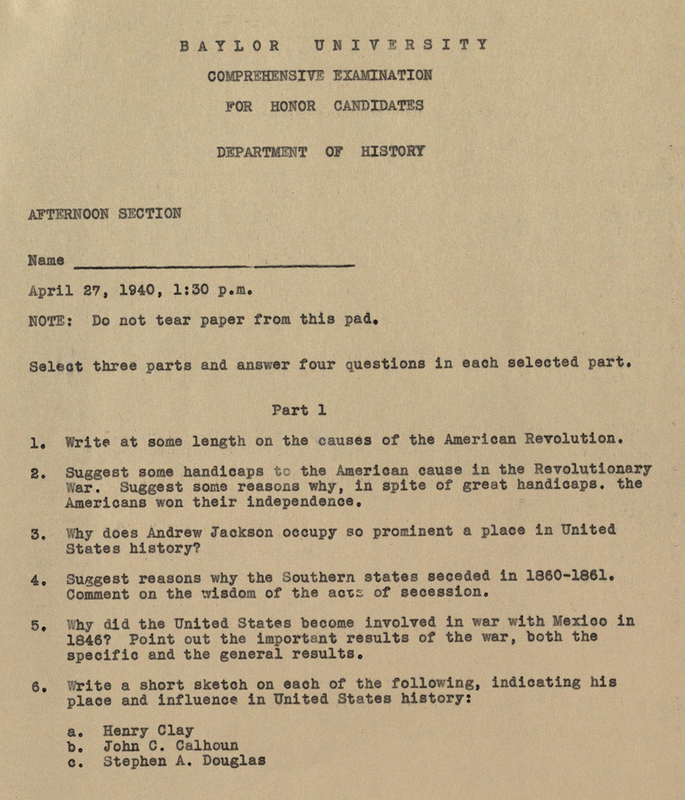 This comprehensive history honors exam represents one of various subject exams from 1938-1941. BU records: Honors Program #BU/108 , box 2, folder 10. BU records: Honors Program, 1935-1941 (#BU/108): Materials from an early attempt to standardize graduation with honors across participating Baylor programs. [Robinson] First Baptist Church records, 1866-1969 (#1434): Records of the church, including minutes, membership lists, and other administrative materials. Christopher J.J. Thiry Baylor Sports Cards collection, 1975-1992 (#3933): Collection contains sports cards of popular Baylor football and basketball players. Foy Valentine papers, 1918-2000 (#2948): Materials documenting the life of Foy Valentine, a leader in various Baptist organizations and Baptist philosophy on ethics. [Waco] Veterans Administration Medical Center records, 1938, 1945-1982 (#2608): Photographs, newspaper clippings, pamphlets, and other materials about the Veterans Administration Medical Center in Waco, Texas. Sarah C. Pier Wiley papers, 1838-1868 (#139): Includes letters, photographs, and a journal about life on the Texas home front during the Civil War. 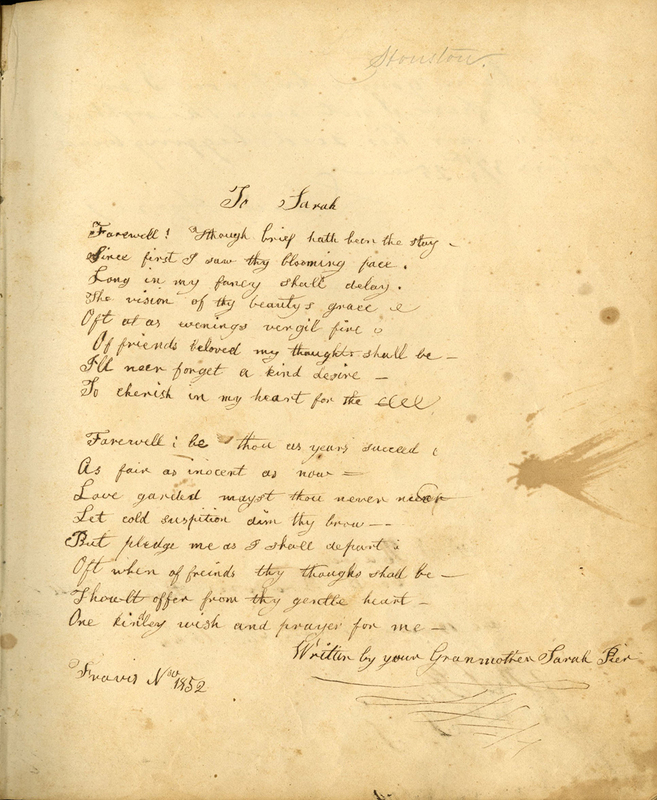 It was popular in the mid-1800s to handwrite poems in the personal notebooks of friends and family. Here we see Sarah Pier’s grandmother dedicating a poem to her. What poems would you dedicate to your friends and family? Sarah C. Pier Wiley papers #139, box 1, folder 6. The fan favorite Ted Lyons, “The Sunday Pitcher,” is given a gift (is it the car?) from the White Sox contingent. Ted Lyons papers #1485, Box 1, folder 5. It is every young Little League pitcher’s dream: to lead a college baseball team to a conference championship, try out for a major league team, and pitch in the majors in the very same month. But for Baylor star pitcher Ted Lyons, this scenario was not just a dream, but a happy reality. The Theodore “Ted” Amar Lyons papers, held at The Texas Collection, tell the story of Lyons’ mercurial rise to fame as a Hall of Fame pitcher for the Chicago White Sox, the only Baylor baseball player to have such great success at the professional level. 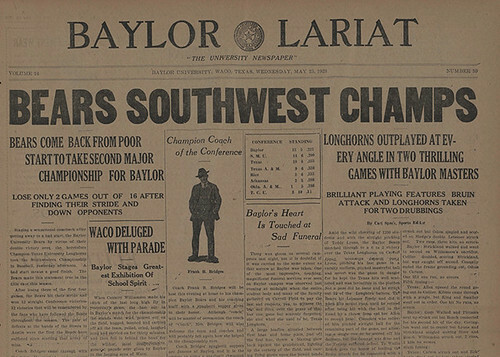 The Baylor Lariat headline when Ted Lyons led his team to a Southwest Conference victory in 1923. Admitted to Baylor on a baseball scholarship in 1919, Ted Lyons was also the starting center for the Baylor basketball team. After his coach convinced him to try pitching, Lyons’ career took off. His Baylor baseball years culminated in a victory over the Texas Longhorns in 1923, where Lyons pitched a 6-2 game to claim the Southwest Conference Championship. On July 2 of that same year, Lyons signed a contract with the Chicago White Sox and pitched in his first major league game the very same day. “Three Kings of England wearing derbys shake hands with Teddy Lyons: George V, Edward VIII, then Prince of Wales, and George VI, when he was on tour in England 15 years ago.” (Description from Baylor Century, January 1943.) Ted Lyons papers #1485, Box 1, folder 4. Ted Lyons with the Baylor University Band, undated. Ted Lyons papers #1485, Box 1, folder 4. In 1942, after a season where he posted an exceptional 2.10 ERA, Lyons left baseball to join the war effort. As a Marine, Lyons served primarily in the South Pacific, notably organizing a baseball camp in the Marshall Islands to spread goodwill with America’s national pastime. After returning to the White Sox in 1946, Lyons pitched one more season before becoming the Sox manager for three years. He was inducted into the National Baseball Hall of Fame in 1955. Ted Lyons pitching for the Chicago White Sox, where he spent his entire 21 year career. Ted Lyons papers #1485, Box 1, folder 5. Ted Lyons never married and spent the rest of his life back home in Lake Charles, Louisiana. Even as late as 1981, he was receiving hundreds of autograph requests each year. He died on July 25, 1986. His legacy and career as a Baylor Bear and White Sox pitcher are an indelible part of Baylor’s history. His small collection of papers at The Texas Collection, consisting of letters, clippings, and photos, will preserve his memory and fuel baseball dreams for generations of Little Leaguers to come. 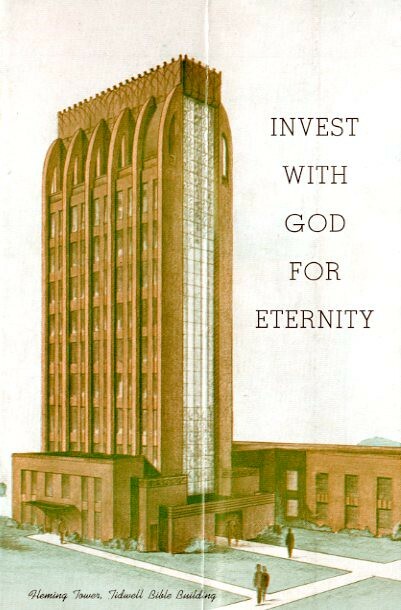 Tidwell Bible Building promotional brochure, late 1940s-early 1950s. Note that the architectural design on this piece is not what was built! BU Records: Tidwell Bible Building Campaign Committee, box 1, folder 6. Theodore “Ted” Amar Lyons papers, 1925-1996, undated: The Lyons papers consist of correspondence, literary productions, and photographic materials relating to the Baylor University and Major League Baseball career of Hall of Famer Ted Lyons. BU records: Tidwell Bible Building Campaign Committee, 1934-1963, undated: Meeting minutes, correspondence, financial and legal records, as well as other documentation regarding fundraising efforts for and construction of the Tidwell Bible Building on the campus of Baylor University. Waco University collection, 1861-1958, undated: Materials created by and about Waco University, which existed in Waco, Texas, from 1861 to 1886, before being combined with Baylor University.